Born in London, Butler spent most of his early life in Kent. He initially studied art at Maidstone School of Art then St Martin’s and finally The Royal College of Art, London. After art school he spent 10 years working as a professional stone carver, responsible for carving ‘The Queens Beasts’ in Kew Gardens. He was a visiting tutor to the RA school and in 1964 was elected a member of the Royal Academy. In 1972 Butler was commissioned to make a portrait statue of President Kenyatta, the 12 foot high statue of the seated president was a turning point in his career and since then he has completed many public commissions both in the U.K. and abroad. Including, Daedalus –‘A Memorial to the Fleet Air Arm’ sited on the Embankment. The ‘Rainbow Division Memorial’ at the site of the Croix Rouge Farm, Fere-en-Tardenois, France. Butler has also designed the ‘Royal Seal of The Realm’ and worked with the Royal Mint. 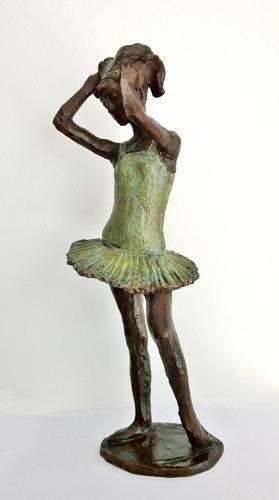 James Butler’s other works are of children, dancers and female nudes. He lives and works in Warwickshire.